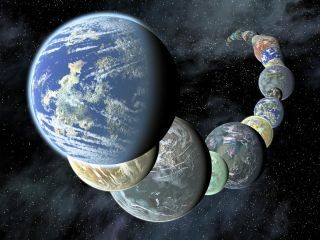 Data from NASA's Kepler mission finds evidence for at least 100 billion planets in our galaxy. Image released January 3, 2013. Thousands of scientists have flocked to Southern California for the biggest gathering of astronomical minds of the year, a meeting that organizers have dubbed the "Super Bowl of Astronomy." Nearly 3,000 scientists are expected at the conference, which will mark the 221st meeting of the American Astronomical Society. This year, the annual space conference is being held at the Long Beach Convention and Entertainment Center in Long Beach and runs in earnest from Sunday to Thursday (Jan. 6 to 10). "Our winter meeting is generally about twice as big as our summer one and is the biggest astronomy meeting of the year," AAS meeting spokesman Rick Fienberg said. While scientists will attend the AAS meeting from all over the world to discuss the latest space discoveries, NASA will unveil its newest findings from space telescopes probes across the solar system. "NASA scientists will present new findings on a wide range of astrophysics topics," space agency officials wrote in a press announcement Friday (Jan. 4). NASA is expected to discuss "a new video of a rapidly rotating neutron star, the latest images of the supernova remnant Cassiopeia A, and the most detailed "weather map" of a brown dwarf star," officials added. SPACE.com's Clara Moskowitz, Miriam Kramer and Tia Ghose will provide complete coverage from the 221st AAS meeting. You can track the conference on Twitter by following Clara (@ClaraMoskowitz), Miriam (@mirikramer) and Tia (@tiaghose) and by following the hashtag #AAS221.